Thank you so much for your words of encouragement and support regarding my Aunt Alice. I appreciate each and every one, and I extremely grateful that you take the time to stop by and say what you have to say. After returning from St. Louis, it has been a busy week at the Shifley household. The one and only awesome 3-year-old in our house pooped in the toilet. When he showed me his accomplishment I think I scared him because I was so excited about what he did. So it looks like we are getting close to getting this potty training thing knocked off the to-do list. Kyle also traded in his toddler bed for his bunk bed. He is pretty excited to be in a "big boy" bed and I am pretty excited that it is finally put together. Sweet Lincoln's mullet that was a project. I knew being a parent had some tough times but being the chief engineer on some of these builds can be frustrating on both my mental facilities and my liver. Also this week, Little Miss Hayden turned 6-months-old. She is doing well and hitting all the right numbers on the charts. 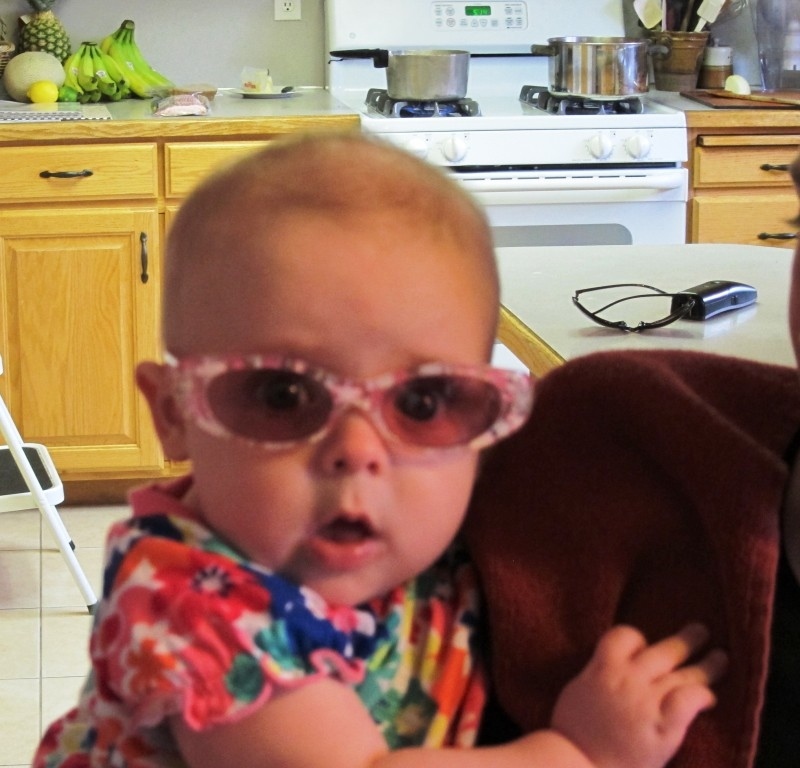 She is growing up so fast and is already starting to accessorize. Finding this quote by Bob Marley - "Truth is, everybody is going to hurt you; you just gotta find the ones worth suffering for." - especially relevant this week. I was hurt recently by a person I have known for a long time, and this person has hurt me numerous times in the past. From my vantage point, I have done a lot for this person but I will no longer be helping out as they are not worth the anguish. It hurts me to do it but it needs to be done. Here is a little amusement to balance out some of the humorless points: Two hunters are out in the woods when one of them collapses. He doesn't seem to be breathing and his eyes are glazed. The other guy whips out his phone and calls the emergency services. He gasps, "My friend is dead! What can I do?" The operator says "Calm down. I can help. First, let's make sure he's dead." There is a silence, then a gun shot is heard. Back on the phone, the guy says "OK, now what?" Hope you have a wonderful Memorial Day weekend. As we gather with family and friends on Memorial Day, we need to remember to celebrate the blessings of our hard-won freedom and those who made it possible. Loved the joke! What big changes in your household with the pooping and the glamour girl. sorry to hear about your friend--it is always a tough decision to sever ties, but sometimes necessary. Thanks for visiting my blog. I have 'followed' you. It's your fault for being interesting and sounding like a decent guy, and your profile is so inspiring! The toilet training, what an achievement, and so young too. I hope to reach that pinnacle soon! So sorry to read about your recent bereavement, but of course people we truly care about never die in our hearts. She will still be guiding you. Best wishes to you and yours. John. Loved this post, Matthew. The 'person' made me sad that there are still folk around who like to hurt. The joke made me laugh. Best of all was the news about Kyle's and Hayden's progress. I can't believe Miss Hayden is six months old already. She's a real beauty. Wishing you and your family a happy Memorial Day. We start toilet training this weekend with Colin. I just hope it goes as well as you've done. And the joke? Loved it. Hello, Mr. Shifely! Sounds like life is moving along just as it should with all of its joys and despair. Yay! for Kyle's pooping on the potty! And look at that gorgeous girl! so sorry to hear aunt alice passed away. now i have boy george stuck in my head, do you really want to hurt me? i must confess to being a fan of george. You know what you do to potty train? Take the other bunk bed and take a giant dump in your pajamas. Wait, don't do that. Also sorry to hear about the person that hurt you. Yeah, I've stayed away from bunk beds too. Yikes. 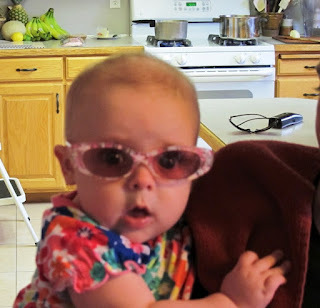 Hayden looks so cute in her sunglasses, which I've learned all kids should be wearing (UV proof). 80% of the UV our eyes absorb happen before we're 18. Dang! Hope you had a great Memorial Day. I recall many Christmas Eves that were dedicated to assembly of impossible to assemble parts. Your Miss Hayden is so charming and adorable. I just want to hug her! Yay! For Kyle's progress. It won't be long now. I don't know why some people are mean like that. I don't think its healthy for you to have to experience it repeatedly. Good for you for cutting that tie. Be there for those who deserve it.